Ever wanted to make a difference – for your world, for your country or for your neighborhood – but weren’t sure how to get started? Feel a little intimidated at the idea of contacting an elected leader – whether your city council member, your state legislator or a Member of Congress? Think it’s impossible to gain the attention of elected leaders without sending them a big campaign contribution? 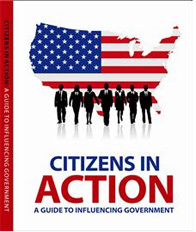 In Citizens in Action, Stephanie Vance, the “Advocacy Guru,” takes the controversial position that it is possible to get heard on the Hill, that not all politicians are corrupt (OK, a few are), and that citizens can “get things done” from Washington, D.C. to their city council. Vance’s tips and advice are helpful whether you’re just getting started on an advocacy effort or have been trying to gain the attention of elected officials for years.